If life isn’t the bowl of cherries you’re hoping for, make your own with this chocolate cherry smoothie bowl! 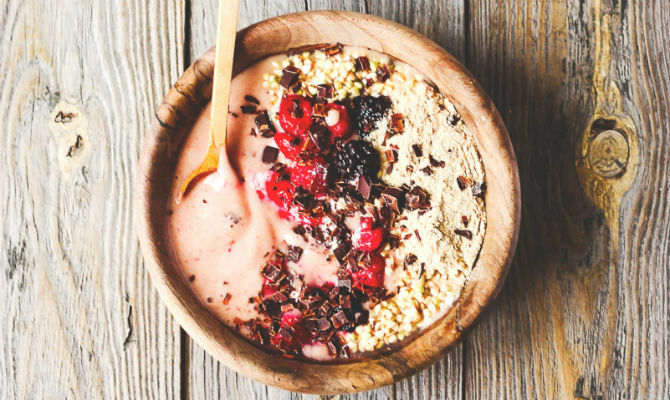 This decadent smoothie bowl is healthy and delicious, making it a great breakfast, dessert, or snack for any time of day! Plant-based living is not only delicious, but it’s good for your health, and for the health of our planet. When we live mindfully and care for the wellbeing of ourselves, others, and the world, we are practicing love. What better way to practice love and share wellness than to eat great vegan food? Gather your blender and ingredients to join me in this smoothie bowl that’s sure to satisfy your sweet tooth. Shredded coconut, fresh berries, cacao nibs, granola, walnuts, and any of your other favorite toppings! Blend all ingredients together in a high-speed blender. Bonus points if you blender boogie! Pour your blended ingredients into a bowl, top with desired garnish, and serve! Note that the mixture will be very thick. For ideal vegan ice cream consistency, do not add any non-dairy milk or water. However, if you would like a more smooth and thin consistency, add non-dairy milk or water for desired texture.